The mantra of our fellow Windjammers last year was “It’s not usually like this.” Amid the groundings, crazy powerboaters, and blinding gales, we got beat up a bit on our first cruise with the club. We decided to get back on that horse though, now with a few much bigger cruises under our belts, and make another run at Cattus Island on the weekend of our wedding anniversary. Cattus Island is barely an island, as far as I can tell. Even highly authoritative sources such as Wikipedia put “island” in scare quotes when talking about its purchase in 1690. You can supposedly kayak around it in certain tidal conditions, but I think you can just as easily walk to it from the mainland most of the time if you’re not wearing your fancy shoes. Regardless, it’s a nice piece of reasonably wild recreation area surrounding Mosquito Cove, making for a quiet and sheltered anchorage. The plan, as outlined by the Cruising Chair, was to set out at 11:00 am. We weren’t too concerned about leaving with the armada and I really wanted to get shipshape before rafting up so we took some time to scrub the boat and didn’t really get going until 11:45. The meter at Trixie’s was reading 17kts when we left, so we put a reef in just in case, unfurled the genoa to about 110, and sailed down with a northwest wind all the way to the Mathis Bridge. I’ve mentioned before that sailing under bridges is particularly momentous for us, although I’m still not exactly sure why that is. I guess it’s a sort of hard delineation that’s not found in open water. In this case, it was even more impressive since we’re just a tad too tall to make it through the shorter span of Route 37 without the bascule bridge being opened. Jen got on Channel 13 and hailed “Mathis Bridge, Mathis Bridge, Mathis Bridge, this is the sailing vessel Fortuitous approaching from the south, requesting an opening at your convenience, over,” which marked the first time that we’d ever conversed with a bridge. Within a few minutes all of the fake tans and fist pumpers headed for Seaside Heights had to stop so that Fortuitous could motor through. We thanked the operator and continued north toward Silver Bay. We had fired up the motor to power through the bridge, but immediately went back to sailing on the other side. This was where we ran aground last year, but either because of our experience or [more likely] because there were still no Windjammers in sight, we navigated the north end of the bay without difficulty. We sailed the entire way into Silver Bay, tacking through the legs that were directly upwind. As we got within view of Mosquito Cove and noticed that there weren’t any sailboats in it we started to wonder if the trip had been canceled—we left late and should have been the slowest boat. Just then the VHF started crackling with Windjammers organizing themselves for their own bridge opening. They were apparently running later than we were, and had called our cell phones to let us know after we’d already gone into vacation mode. Jen got in some tiller time on just the reefed main (even though the wind had dropped down to 10kts or less) while we waited for the fleet to arrive. April Star arrived and we sailed into the anchorage after them to say hello to the Commodore. Sashay was next, and we rafted up with them. Nora joined us a little later. We borrowed Sashay‘s dinghy and rowed ashore to check out Cattus Island, since we’d never actually made it the nature festival last year. It was nice, but a fairly typical pine barrens marsh. While we were on land, Stormy Petrel, Mystique, Alradee-Chi, and another boat (Aquila?) arrived and made a second raft up, and Waterloo anchored on her own. We made some dinner, got a tour of Sashay, and I had some fine PBRs, hipsters be damned. The real party was on the other raftup, and we eventually dinghied over to Mystique, where we had 18 people in the cockpit of an Irwin 32. Stormy Petrel was finally heading off on their retirement from land in the morning, so we sent off Ron and Kathy with stories of fouled anchors, storms, and how much they’d taught all of the Windjammers over the years. We left a little early and rigged for sleeping. It was cold outside in the morning, but the boat stayed warm and we’d slept well. It rained overnight, and there were periods of wind that made the rigging sing, so I was kind of surprised when I woke up and it wasn’t blowing 35kts, as it was last year. I made some fresh ground Sumatra and we dawdled as the other crews prepared to go to the nature festival. Although it looked pretty fun, we decided to skip out on the land part and sail. Since we were already that far north we wanted to see what else was up on that side of the bay, so we set the full main and eased up on a broad reach with the now southerly winds. We had a brilliant morning sail all the way up to the Mantoloking Bridge, marking our most northerly expedition to date. Given that we were pointed so far downwind, we hadn’t really noticed that the wind had picked up considerably until we turned around to sail home. We decided to formally test out our topping lift by reefing without starting the motor. It was a little more exciting than it needed to be, but I think it was good practice and we did pull it off without anything seriously going awry. As we were reefing down, we were passed by a fleet of 420s having a blast, flying everything and hiking like crazy. Despite the relatively chilly temperatures and brisk breeze, there were actually a lot of boats out as we picked our way south against the wind. When we made it back to the entrance to Silver Bay we heard over the radio that the Windjammers were already going back through the bridge, confirming to us that we were better off sailing. The wind continued to rise, and to get through the narrow channel back toward the bridge we had to switch to motor, but we left the reefed main up for stability and to help us along when we could bear off a bit. Jen stopped traffic again as we returned to our home waters and rigged for sailing. 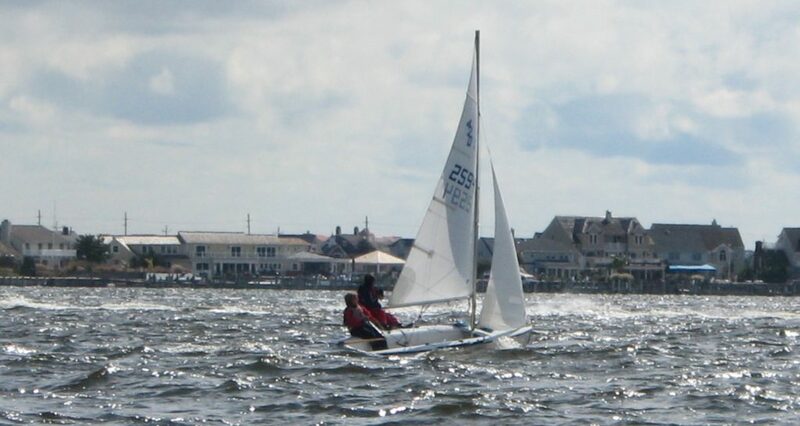 By the time we got to the mouth of the Toms River, it was blowing a powerful 25kts true (which we only know because we saw Providence II returning from a race on the Toms and Val has a proper wind gauge). With the entire fetch of the bay to the south the waves were up too but we sailed on, undaunted. There was a time when we would have been pretty nervous in those conditions, but I do think we’re getting better. We never felt out of control on a reefed main and a handkerchief of a jib for balance…it was just annoying that we couldn’t make much headway through the waves. Fortuitous was well mannered though, and we only switched to motor when it became clear that we were losing daylight. Not sure what the lens flare is all about in that video, but it lends a magical flair to a great weekend of sailing. We were the first in and last out on the water, made a bridge open for us, spent time with good people, and faced some bigger weather without flinching. I can’t think of many better ways to have celebrated our anniversary. More pictures are in the Gallery. Great writeup. Sounds like a nice trip.